In order to view the list of available tasks, it is necessary, while in the hangar, to press the button "Tasks". The task can include the destruction of ships, causing damage or a set of effectiveness in battle. Each of which will add 10% to the constantly added credits and experience of the ships. Same bonuses from DLC are added together. In the tasks window you can see several tabs. Tasks are sorted by these tabs for easy reference. Here there are tasks related to the current event in the game. Contracts are a good way of earning resources by doing them in open space. The progress of the execution of contracts is saved when you exit the game. Also here are located the UMC special orders in missions, for which you can get . A special type of assignments that, once completed, becomes available again the next day with the same conditions and reward. Exception. There are several tasks, one of which can be changed once a day to another, similar in style, but slightly with different conditions. The rewards are materials and parts for the workshop, and corporate (DOESN'T COME at the expense of the pilot). Patrol - another daily mission, these contracts allow you to send a number of ships on a few-hour patrol. During patrol, the assigned ships will be unavailable for for use until the mission is either cancelled or completed. While any ship can be sent, ships with improved experience will often yield a higher credits reward. Upon completion, the player receives a sum of credits, determined by the patrol time and the ships assigned. 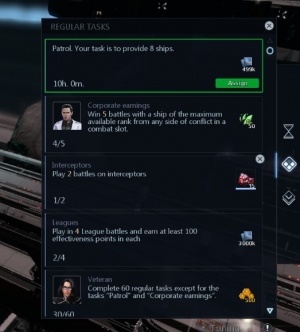 Tasks for Sector Conquest and for Leagues are also located here. Here are the tasks for enriched monocrystals and xenocrystals for victories in PvP, PvE and CO-OP. Tasks for containers for Special Operations are also here. The cost of a container is 100 . The lifetime of the container in the store is 3 hours.